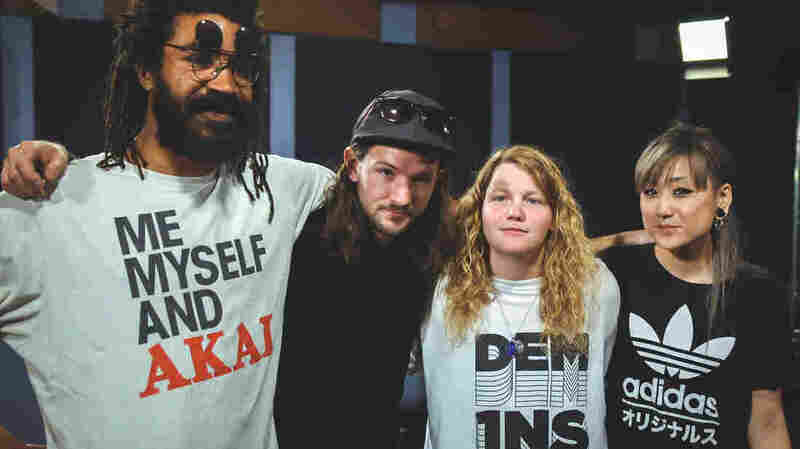 Watch Kate Tempest's Full Set For World Cafe : World Cafe Get a look inside the studio as the South London artist performs the first four songs off her latest record, Let Them Eat Chaos, uninterrupted. Kate Tempest (second from right), arm in arm with her band in the World Cafe performance studio. And just before 10 p.m., Tempest walked up on stage, looking just like anyone's low-key friend: small and unassuming, wearing an oversized T-shirt and jeans. But as soon as she opened her mouth to rap, words tumbled out of her with an intensity that is unmatched. She transformed into a magnet. You couldn't help but be transfixed. Tempest went on to perform her latest album, Let Them Eat Chaos, in its entirety. And I swear, the whole time, not a single person spoke or took out their phone — you could hear a pin drop. "Essentially, it's an organizing principle, so that we meet the internal realities of seven strangers. At that time in the morning, people are open with their vulnerabilities because they are not in the previous day or the coming day. The day doesn't belong to anyone yet." Hear the complete session above, and watch the full 16-minute performance via VuHaus below.